In 2012, ministers of the environment from all provinces and territories in Canada, with the exception of Quebec*, agreed to implement the national Air Quality Management System (AQMS) to manage cumulative effects on air quality across the county. The AQMS establishes Canadian Ambient Air Quality Standards (CAAQS) for air contaminants of concern and outlines a framework to maintain ambient air quality in Canada below the CAAQS. Alberta has chosen to fulfil its commitment to implement the AQMS through the regional planning process as described in the Land-Use Framework (LUF) and its accompanying legislation, the Land Stewardship Act (LSA). 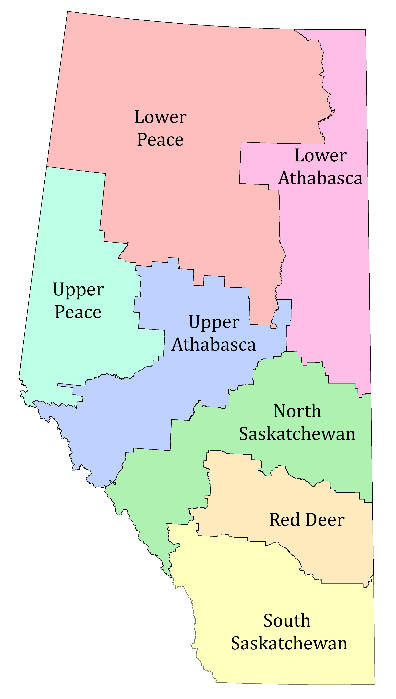 The Land-Use Framework designates seven land-use planning regions across the province and calls for the establishment of a regional plan for each (Figure 1). Regional plans identify economic, environmental and social objectives for each land-use planning region as well as the strategies required to achieve them, and are considered to be regulations under the LSA.Once developed, each regional plan will outline objectives related to air quality, and establish a regional air quality management framework for achieving the desired objectives. Implementation of each of these regional air quality management frameworks will serve as Alberta’s implementation of the national AQMS. *Quebec is not implementing the system because it includes federal industrial emission requirements that duplicate Quebec’s regulations, however Quebec is working on developing other elements of the system (CCME, http://airquality-qualitedelair.ccme.ca/en/). Figure 1: The seven land-use planning regions as outlined in the Land-Use Framework (2008). 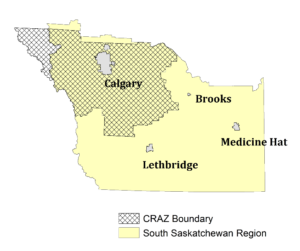 The Calgary Region Airshed Zone (CRAZ) is situated within the South Saskatchewan Region as defined in the LUF (Figure 2). 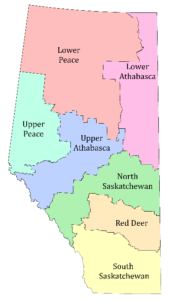 In 2014, a regional plan for this region, the South Saskatchewan Regional Plan (SSRP) was established. At the same time, the South Saskatchewan Region Air Quality Management Framework for Nitrogen Dioxide (NO2), Ozone (O3) and Fine Particulate Matter (PM2.5) was established under the SSRP. 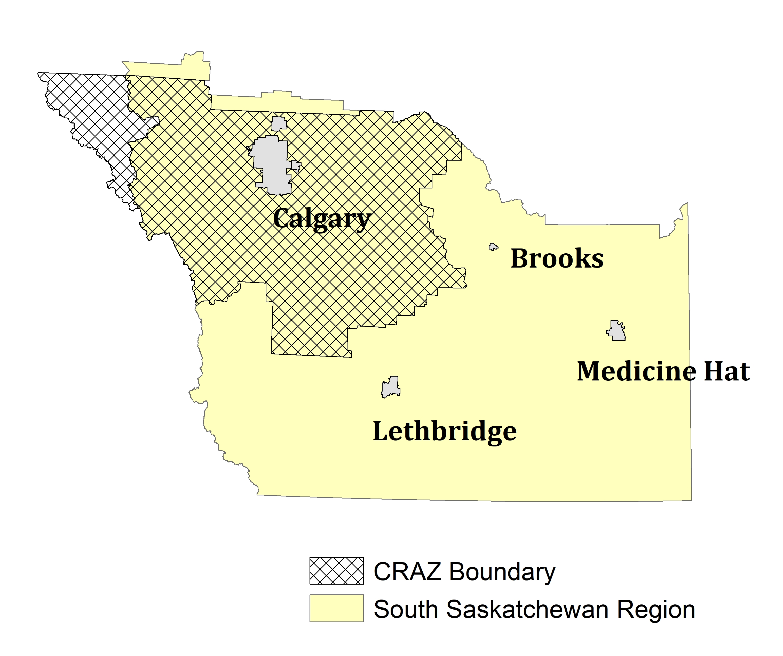 Figure 2: The CRAZ boundary is located within the South Saskatchewan Region as defined in the Land-Use Framework (2008). The South Saskatchewan Region Air Quality Management Framework (SSR AQMF) translates the management framework outlined in the national AQMS for implementation at a regional scale. Like the national AQMS, the SSR AQMF identifies air contaminants of concern, known as indicators (NO2, O3 and PM2.5) and identifies numerical triggers and limits for each. Triggers are warning signals that air quality is moving toward undesirable levels, while limits are numerical thresholds that should not be crossed. Each year, ambient air quality is assessed against the triggers and limits and a Management Level (Levels 1 to 4) is assigned to each air quality monitoring station (Table 1). Different degrees of action are required depending on the management level assigned (Table 2). Table 1: The numerical triggers and limits for each indicator that are used to assign the Management Level for each monitoring station. Table 2: The Description and Management Intent for each Management Level are used to determine the degree of action required to effectively manage air quality. The O3 and PM2.5 limits under the SSR AQMF align with the current CAAQS values for O3 and PM2.5 which were established in 2015. Currently, the NO2 limit in the SSR AQMF is based on Alberta Ambient Air Quality Objectives (AAAQOs) because there is currently no NO2 CAAQS in place under the national AQMS. However, in 2020 a new CAAQS value for NO2 will come into place under the national AQMS and the NO2 limit in the SSR AQMF will be replaced to align with this new CAAQS value. Since the 2020 NO2 CAAQS are more stringent than the current AAAQO values, further management of NO2 may be required when the new NO2 CAAQS come into place in 2020. Further, since the CAAQS are established based on a principle of continuous improvement, the O3 and PM2.5 CAAQS will also be updated in 2020 to reflect increasingly stringent air quality management. The current limits under the SSR AQMF are compared to the 2020 CAAQS limits in Table 3. Table 3: Comparison of the current limits outlined in the SSR AQMF and the CAAQS values to come into effect in 2020. **The current SSR AQMF Limit for NO2 (Upper Range) is represented by the 99th percentile of the hourly data while the 2020 CAAQS NO2 are represented by the 3-year average of the annual 98th percentile of the daily maximum 1-hour average concentrations. CRAZ and its members play a significant role in managing air quality in the CRAZ region to achieve the CAAQS in large part through implementation of the CRAZ Particulate Matter and Ozone Management Plan (the Plan). The Plan was established by CRAZ in 2008 and is reviewed and updated every 5 years. In anticipation of the new NO2 CAAQS coming into place in 2020, the current review of the Plan, which has been ongoing throughout 2018, has ensured that NO2 is sufficiently addressed in the Plan. The updated version of the Plan, to be put in place in 2019, is proposed to be renamed the Air Quality Management Plan to reflect the additional consideration of NO2. As the NO2 CAAQS and the more stringent O3 and PM2.5 CAAQS come into place in 2020, Alberta will continue to rely on the invaluable support of CRAZ and its members to ensure that air quality in the CRAZ region continues to achieve the CAAQS now and in the future.